Parker Bilal (The Divinities) & Bev Thomas (A Good Enough Mother) talk crime fiction with bestselling thriller writer & Balham resident Sabine Durrant. Don’t miss the chance to hear from these gripping chroniclers of London, whose characters inhabit settings including Balham, Battersea & Clapham. A Good Enough Mother is the debut novel from Bev Thomas, who was a clinical psychologist for many years. It’s a dark and gripping exploration of the complex dynamic between a patient and a therapist, and a look at the responsibility and limitations of motherhood. 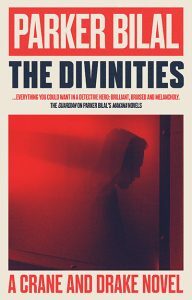 The Divinities is the first in a compelling new London crime series from the Theakston Old Peculier-nominated creator of the Makana Investigations novels, Parker Bilal. He introduces the intriguing Crane and Drake partnership in this riveting novel with a London setting at its very core.